During his lifetime, Austrian aeronautical engineer and philanthropist Dietrich W. Botstiber established a charitable fund, the Dietrich W. Botstiber Foundation. Among other goals it was established primarily to promote an understanding of the historic relationship between the United States and Austria. In 2007, the Botstiber Institute for Austrian-American Studies was founded to support Austrian-American studies through historical research. Recently, the Advisory Board of the Botstiber Institute for Austrian-American Studies (BIAAS) held its constitutional meeting in Washington, D.C., where the First Annual Dietrich W. Botstiber Lecture on Austrian-American Affairs was given by the former Austrian Prime Minister Dr. Alfred Gusenbauer. Dietrich Botstiber’s Vision - Promote Understanding of Austria in the U.S.
Dietrich W. Botstiber was born in Vienna in 1912 and came from a very privileged Austrian family. His father Hugo Botstiber was the manager of Vienna’s Konzerthaus, one of the major musical institutions in Vienna, and he was fortunate to grow up in a home frequented by notable composers, conductors, musicians and singers. His autobiography, “Not on the Mayflower,” published in 2007, describes his childhood and youth in Austria. Although he received a classical education, his interests in science and technology led him to study at the Technical University of Vienna where he graduated in 1935. Dietrich Botstiber witnessed some of the most tumultuous events in modern Austrian history. In his memoirs he describes the difficult social and economic conditions in Austria following the breakup of the Dual Habsburg Empire up to the annexation of Austria by Hitler-Germany in 1938. Since the country offered him little opportunity to apply his technical skills and interests, he left Austria for the United States in 1938. After working in a wide variety of jobs involving project development (from cigar manufacturing, machinery and vending machines to armaments and helicopters), he founded the Technical Development Company (TEDECO). He was a pioneer in work on failure detection devices and high-speed power transmission assemblies, and TEDECO was also involved in consulting and in manufacturing for the major aerospace companies. Botstiber retired and sold TEDECO in 1985 and died seventeen years later in December, 2002. Earlier in September, 1995, Dietrich Botstiber had established a trust that would serve as the governing document for his Foundation and incorporated his vision of contributions to charitable work. One of his objectives in establishing his Foundation was to “promote an understanding of the historic relationship between the United States and Austria.” Terrance Kline, who served as an advisor to Botstiber when he established the Foundation recalls: “Botstiber had lived his youth in Austria prior to and following World War I, and these were highly impressionable years. When he came to the U.S., he felt that Americans were not fully conscious of the dire problems facing Austria at the time. That experience provided part of the reason for setting aside funds for Austrian-American Studies.” Another explanation may have been his mutual love and respect for the two countries which endowed him with the solid foundation and opportunities allowing him to succeed. While Botstiber was grateful for the opportunities America had offered him, he believed that Americans did not fully appreciate the problems Austria faced prior to World War II. The Botstiber Foundation was led by Robert T. Boylan during the early years. He had been appointed by Dietrich Botstiber to administer and develop the Foundation’s programs. After Boylan’s death in 2002, he was succeeded by Terry Kline as Administrator of the Botstiber Foundation. Today, the Foundation actively manages four programs that advance the Botstiber mission. They include the Botstiber Scholars Program, the Botstiber Institute for Austrian-American Studies, Aid to Vulnerable People and Aid to Vulnerable Animals. In an effort to find experts in the field of Austrian American Studies, the Botstiber Foundation funded a Visiting Professorship at Columbia University. In 2007, University of Graz Professor Siegfried Beer, a professor for late modern and contemporary history, was selected by Columbia University as guest professor and entrusted with coordinating the establishment of the Botstiber Institute for Austrian-American Studies. Professor Beer was instrumental in involving academic institutions that had been doing research in the field of Central European history for a number of years, including the Centers for Austrian Studies at the University of Minnesota and at the University of New Orleans. 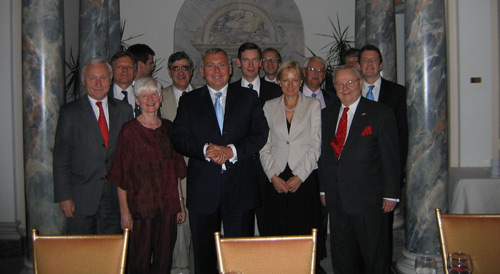 On June 26, 2009, the Advisory Board of the Botstiber Institute for Austrian-American Studies (BIAAS) held its constitutional meeting in Washington, D.C. Composed of scholars and academicians under the leadership of Professor Siegfried Beer, the Board advises the Institute and the Foundation Trustees, Terrence Kline and Dorothy Boylan, of the projects which are recommended for funding. The Botstiber Institute for Austrian-American Studies currently supports fellowships, seminars and academic research at the University of Minnesota, the University of New Orleans and Rutgers University. The BIAAS also supports programs of the Austrian Cultural Forum in New York City. The Institute also implements its own program, such as the Botstiber lecture given by Former Austrian Federal Chancellor Gusenbauer at the Austrian Embassy on June 26, 2009. Within the next few months plans are to offer fellowships and research projects in Austrian-American studies. The grants will be posted soon.